WESTPORT, Conn., Aug. 15, 2018 — Edward Nusbaum, a Westport-based family law attorney, was recognized in The Best Lawyers in America© for 2019. He has been rated Best Lawyers in America for 25 consecutive years and ranks among the top five percent of private practice attorneys nationwide. Attorneys listed in this 25th edition of The Best Lawyers in America were selected after an exhaustive peer-review survey that confidentially investigates the professional abilities and experience of each lawyer. Recognition in Best Lawyers® is widely regarded by both clients and legal professionals as a significant honor. Nusbaum has been practicing family law in Westport for more than 35 years. He has been a Martindale-Hubbell AV Preeminent-rated attorney for 25 consecutive years and been named a Connecticut Super Lawyers Top 50 attorney by Thomson Reuters. Attorneys named to The Best Lawyers in America were recognized by their peers in the legal industry for their professional excellence in 145 practice areas. 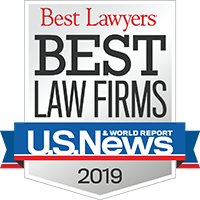 For the 2019 edition of The Best Lawyers in America, 7.8 million votes were analyzed, which resulted in almost 60,000 leading lawyers being included in the new edition. Lawyers are not required or allowed to pay a fee to be listed; therefore, inclusion in Best Lawyers is considered a singular honor. Nusbaum is a Fellow and past president of the Connecticut Chapter of the American Academy of Matrimonial Lawyers and is a Fellow of the International Academy of Family Lawyers, the leading organizations of family law practitioners. He also is a member of the Connecticut Bar Association’s Resolution of Legal Fees Dispute Committee. Since it was first published in 1983, Best Lawyers has become universally regarded as the definitive guide to legal excellence. Eighty-three thousand attorneys from around the world are eligible to vote. Best Lawyers has received almost 10 million evaluations on the legal abilities of other lawyers based on their specific practice areas. For additional information about methodology please visit: Best Lawyers methodology.